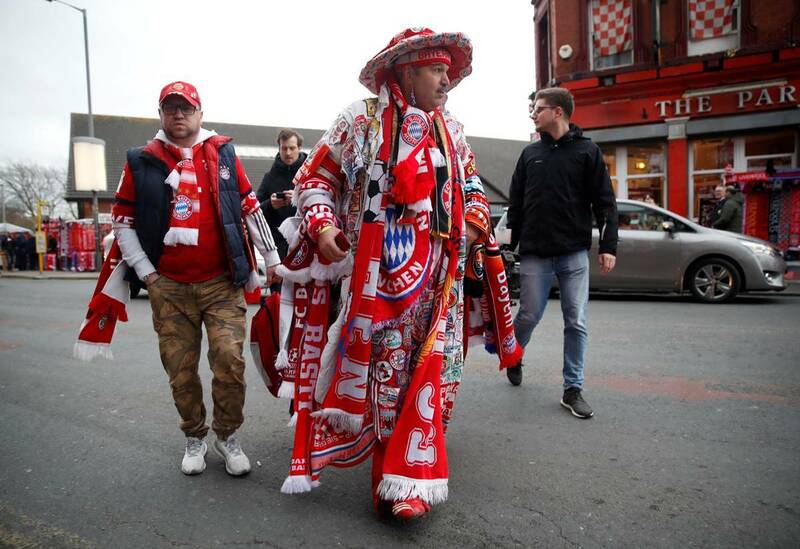 Liverpool vs Bayern Munich Highlights: Liverpool host Bayern Munich in a rare Champions League clash between the two heavyweights. 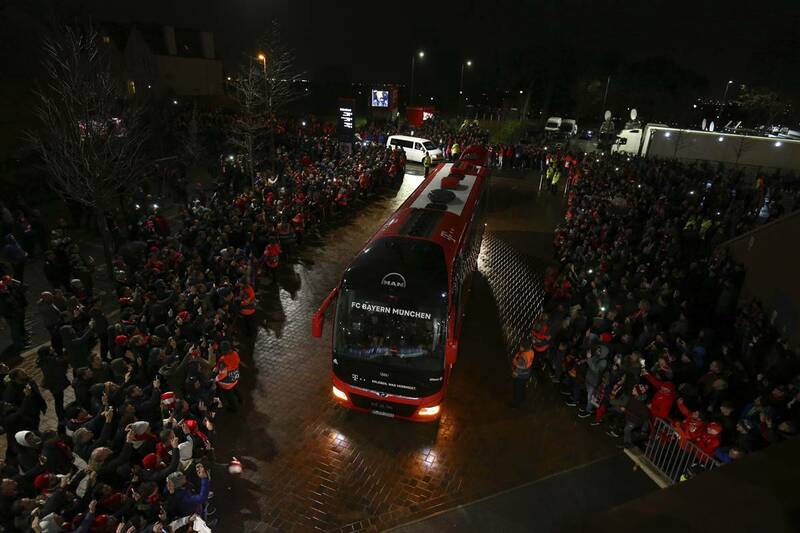 Liverpool vs Bayern Munich Live streaming, Champions League Live score: Liverpool’s Dejan Lovren has been ruled out due to injury and their defensive colossus Virgil Van Dijk is suspended. Liverpool vs Bayern Munich Highlights: Bayern Munich showed all their Champions League experience and quality organisation as they held Liverpool to a 0-0 draw in the first leg of their last 16 match at Anfield on Tuesday in a game of few chances and little drama. Goalless draw, teams cancel each other out, 1-1=0, call it whatever you want. Both sides came with the intent of scoring and they kept running into each other. An entertaining goalless draw always means both sides put in a lot of effort, both physically and tactically, and that has been the case here. Sule goes down after a challenge from Origi. Martinez wasted time in a similar some time back. Bayern have got the result they would have been looking for here. James taken off, Renato Sanchez comes on. Sanchez has played in Anfield last season as part of Swansea. Bayern have been brilliant in keeping out Salah, Mane and Firmino today. James Rodriguez (yes, he has been on the field since the beginning) with a shot from 30 yards out and it goes over the bar. Then, Henderson sets Mane away who in turn passes it to Robertson. Robertson takes the shot and that is kicked out for a corner by Kimmich. Salah makes space for himself and breaks free of the defenders only to run into Wijnaldum. Chance spurned for Liverpool. Thiago stands on Henderson's foot. Doesn't look there was anything deliberate there but Henderson is incensed. Matip then plays a simple pass out of play. 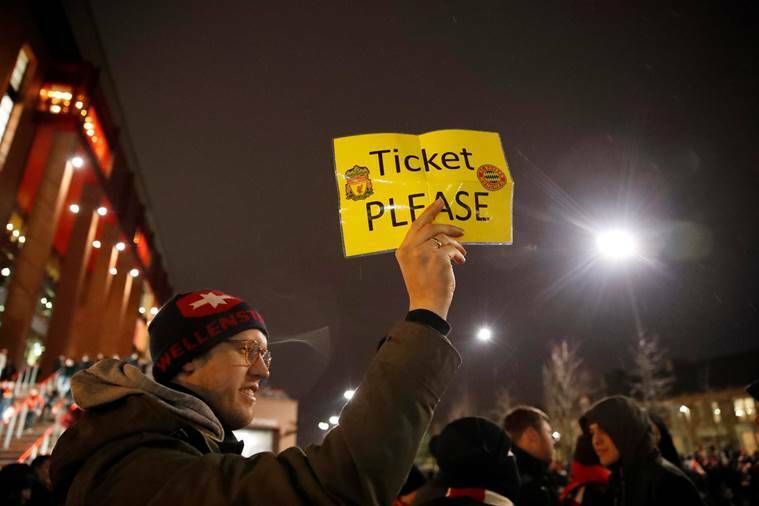 Anfield groans. 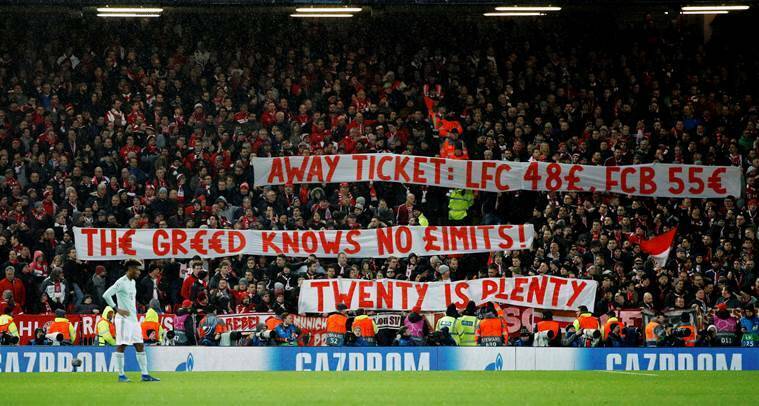 Meanwhile, the Bayern fans unfolded this banner. Poor throw from Liverpool near their own area and Gnabry lets fly from 30 yards out. A great effort but it goes soaring above the bar. Keita with a rather heavy through ball for Robertson and but Sule's attempted clearance bounces off the Scot and roles over to the other side where Salah. The Egyptian can't quite sort his feet out and plays the ball out. Coman charges forward on the left, Lewandowski is inside and is the only Bayern shirt up front, He passes it to Lewandowski but Fabinho puts in a timely challenge to come in the path of the ball. A slow start to the second half, compared to the heavy metal action in the first. Liverpool win a free kick that goes out for a goalkick. Some players make a half-hearted appeal for a corner. And breathe. How this match remains goalless after the first half will be one of the great questions plaguing the world in the coming years. Chances have been made and gifted on both sides and they have all be squandered and defended very well. Incredible one touch play by Salah and Wijnaldum plays in Firmino who then puts in a hopeful ball across the face of goal from the byline on the right. It doesn't find a Liverpool head or foot on the far side. Bayern's corner cleared by Firmino but they come right back with a Gnabry cross, Matip reads it perfectly and boots it out. It's getting hotter. Bayern corner, taken well and Lewandowski fires it goalward, Allison saves. Action shifts to the other side were Salah plays the ball to Firmino on the left who cuts it in. Madness ensues in the box and Matip takes a shot in the midst of it. It is off target and goal kick. Keita's shot takes a deflection and loops up, Mane in the box once again and he has his back to goal once again. He tries the bicycle kick and doesn't get it right. BIG MISS FROM MANE! Firmino cuts accross from left to right before cutting back for Keita who takes a shot from outside the box. It takes a deflection off Sule and roles straight on to the foot of Mane, who is inside the box and onside. But he has his back to goal and can't get his balance right, the shot comes off his ankle almost and woefully runs wide. Kimmich with a rather cynical foul on Mane that leads to a yellow card. It means he won't be able to play the second leg at the Allianz Arena. He has had a brilliant game so far and so its a shame that this has happened but anything less than a yellow card would have been injustice on that occassion. Football can be so complicated sometimes. Free kick Liverpool after a rather silly foul by Sule on Mane near the left-hand corner flag. It is taken by Alexander-Arnold bounces off the mixer in the box and balloons up in the air. It is cleared pretty poorly and falls straight back to Alexander-Arnold on the left who crosses it to the far side where Salah arrives for a free-header. It hits the side netting. Kimmich has been brilliant in defence so far. Keita seemingly plays in Robertson down the right but Kimmich follows him all the way as the Scot tries to make his way into the box. His attempted cross is kicked out for a throw in. Allison takes one touch too many and ends up almost having the ball snatched away from his leg by Coman with absolutely no one covering the goal. He gets away and makes a desperate pass that causes the Liverpool defenders to go into an almighty scramble to clear the self-inflicted danger. Matip makes it worse with a poorly executed flick and it comes to Coman. His shot in the end is off target and Allison takes a deep breath before collecting the ball. Keita passes the ball to Mane on his left and the Senegalese rives forward, Joshua Kimmich covering him and forces Mane to go wider than he would have liked, he takes the shot but it is off target. Game suddenly comes to life. Action shifts to the other end, Gnabry puts a cross in looking for Lewandowski, it hits Matip and ricochets off Allison. Bayern keep it alive with Tiago who cuts the ball in as soon as it comes back onto the ground but Liverpool get bodies in the box and block them out. Henderson with a lofted pass from midfield over Salah's shoulder but the Egyptian is under pressure from two defenders, cannot really get a good touch on it and Neuer collects. Liverpool spent a better part of the first two minutes gegenpressing the life out of Bayern. But Manuel Neuer is as calm as ever with the ball on his feet. The danger is cleared and Bayern do some pressing of their own. "YOU'LL NEVER WALK ALONE!" screams Anfield as the two teams make their way out! Bayern have not been at their best this season, Liverpool have been at their best. But they have rarely played big games without Virgin Van Dijk. If Bayern were looking for a good time to to kick star their season, it is now. Barcelona take on Olympic Lyonnaise. These are the two teams that will play there. Bayern Munich: Neuer, Kimmich, Sule, Hummels, Alaba, Thiago, Martinez, James Rodriguez, Gnabry, Lewandowski, Coman. Subs: Ulreich, Ribery, Rafinha, Davies, Mai, Sanches, Shabani. Liverpool and Bayern Munich have won a combined 10 Champions League titles and so it is a bit strange that they have met each other only once before in this competition. That was in 1981 and the world was a very different place then. For example, the term '20 million pound payout for a sacked manager' was not even a passing thought in the minds of professional football's stakeholders. But apart from the logistics and the slight inflation in the money swirling around in the game's anals, nothing much has changed, has it? After all, it is all about a ball and two goals; the team that hits it into their goal more wins. Oh, and there is the away goals rule to take into account. And also VAR. Piece of cake. Liverpool: Alisson, Alexander-Arnold, Matip, Fabinho, Robertson, Wijnaldum, Henderson, Keita, Mane, Salah, Firmino. Subs: Mignolet, Milner, Sturridge, Moreno, Lallana, Shaqiri, Origi. Bayern Munich: Neuer, Kimmich, Sule, Hummels, Alaba, Thiago, Martinez, James Rodriguez, Gnabry, Lewandowski, Coman. Subs: Ulreich, Ribery, Rafinha, Davies, Mai, Sanches, Shabani.